As a part of my rubber chicken this week, I wanted to come up with a couple of new ideas. So I started here, with the yummiest chicken tacos ever. 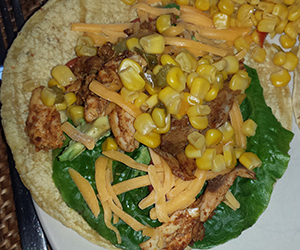 It was a great surprise to the hubster, to come home to not beef, but chicken tacos, and a nice change of pace. Corn tortillas work best, but I think you could use flour tortillas as well. I make my flour tortillas, but found some amazing corn tortillas at Trader Joe’s for 99 cents. Avocados are mega-cheap at Aldi! I bought mine for 49 cents apiece! Heat a skillet on medium, toss a tortilla into the skillet. Cook 30 seconds to one minute on each side, then put to the side. Meanwhile, add olive oil to another skillet and heat to medium. Add chicken to the skillet. Mix taco seasoning and water in a small bowl and pour over chicken. Cook until sauce thickens, about 3-5 minutes. Flatten tortillas on a plate, place 1/2 leaf romaine, 1 slice avocado, tomato, cheese on tortilla, then place cooked chicken on top. We added a Mexican corn (corn with chopped peppers) on top, then ate these like tacos. You can also top with sour cream. Susan Baroncini-Moe is a Guinness World Records® titleholder, author of Business In Blue Jeans: How To Have A Successful Business On Your Own Terms, In Your Own Style , and a business & marketing coach and consultant. When she's not counseling her clients on how to market their businesses, she's making jams, jellies, crafty things, and booze or hanging out with her husband and their delightfully wicked guinea pig, Ginger.